The gourd is one of autumn's most ubiquitous decorative objects. Try your hand at a few gourd crafts to make these fall-themed ornaments! Gourds come in many beautiful patterns, shapes, and textures. They can be striped or speckled, knobby or curvy, and their oranges, yellows, and greens are fall staples. 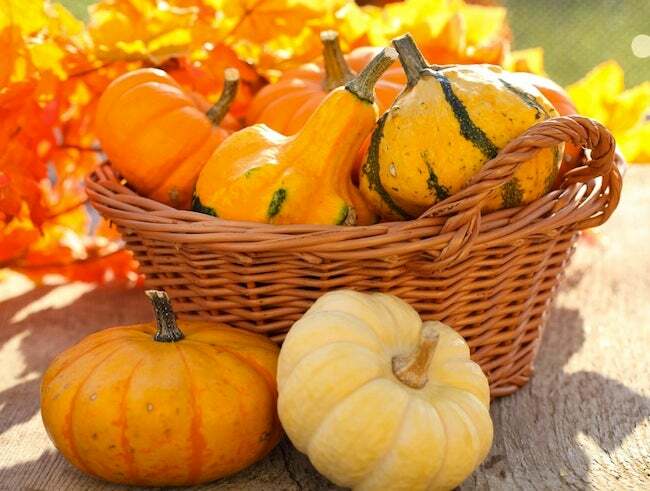 Gourds can be vibrant additions to holiday centerpieces and autumn window boxes. But they can do so much more! If you have an assortment of gourds on hand, try making a seasonal garland by drilling through each gourd and feeding through some twine using a large needle or skewer. Tie a knot on each side of the gourd to hold it in place before stringing the next one. Alternatively, loop twine around the stem or neck of each gourd, tie it in place, and repeat the process until you’ve used up all the gourds. Small, flat-bottomed gourds make lovely tea light holders or even candlesticks. You just need to cut a hole in the gourd big enough and deep enough to hold a taper securely. Depending on the type of gourd, you may need only a pumpkin-carving knife; for harder-shelled varieties, you might need a drill fitted with a spade bit. Still larger gourds can be used as vases. Just cut off the top and hollow out as much of the innards as necessary to accommodate flowers.